Almost the moment Romaine Wilder arrived in Roble, she wanted O U T. A few years, plenty of education and a good job in Chicago with the obligatory showy apartment and a man in her life that is exciting, if not exactly free, and Romaine has it all. Until the city’s budget cuts eliminate her position as a medical examiner, and her life suddenly goes pear shaped. When you add in the not so subtle distance that her doctor-boyfriend is displaying, partially due to his marital situation, no incoming salary and no immediate jobs to hand, she’s temporarily moving back to Roble, while she decides on her next move. Her Aunt Zanne, the woman who took her in after her parent’s death, and occasionally Ioh who am I kidding – constantly) marches to the beat of her own drummer, dragging, cajoling, guilting and always nudging people to follow along, is there to help her pack up for the return. Arriving in Roble, the house / funeral parlor in the pouring rain, an ‘extra body’ that doesn’t belong in the business is there, left by the crematory door. Adding to that lovely event, the sheriff (a cousin) is new to the job, the person who found the body has a history of severe depression and has retreated into herself, there are new people that are ‘now indispensable’ according to Zanne, and everyone believes Romaine is there for good, and will be jumping into the local Crawfish festival planning, the event headed up by her Aunt. 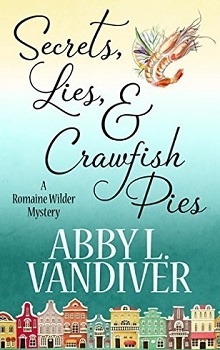 With the county’s medical examiner ill, Romaine is stepping in to autopsy the body, Aunt Zanne is determined to find the killer, and when she’s not spouting outrageous accusations, she’s off for one of her innumerable clubs, charities and boards. Oh – and did I mention that the sheriff, her nephew Pogue, has never investigated a murder, is new to the job, and has a 4 day conference that will take him away from the investigation? We’ll overlook Zanne’s references to his lack of qualifications, or his childhood oddities that stay with you, FOREVER, in these small towns. As if those stories from childhood aren’t enough – the characters here are absolutely wonderful – utterly southern and palpable, with plenty of moments as Romaine is constantly hit with memories, challenges and the pressures overt and covert, exerted by Zanne. From returning to stay, to tagging along on investigations, bullied into baking, a constant battle of her own loyalties to family crossing the lines with investigative propriety, evidence protection and trying to help Pogue without actually doing all the work herself, she’s got plenty on her plate and is constantly fighting the battle between behaving like a petulant child who’s lost her best dolly and pitching in with a good attitude. Pitching in is a given, it’s only when her aunt’s manipulations bring her memories and moments she believed were lost that her own pieces start to fall into place. With the discovery of the killer and unearthing of several other MAJOR secrets that I’m sure will lead to issues in the future, the story was a delightful series of questions and puzzles, each coming together in ways that make absolute sense, after the reveal. Seriously, Zanne was the star of this book and Romaine, while solid, steady and likable was more the straight man to Zanne’s antics. The small town and family feel came through solidly and strong, at times it felt as if I was among the DH’s older relatives: just quietly listening and HOPING to keep up – from childhood stories, to expected participation the love, support and personalities shine through – in this relocated Louisiana Creole family in a small East Texas town.